← If the #Nepal Army is getting paid for #Nepalearthquake, the #Nurses need to get paid as well. Florence Nightingale created the modern nursing profession as we know it today. Happy Birthday! International Nurse’s Day is May 12th, celebrating the birthday of Florence Nightingale. Florence Nightingale is revered in South Asia, though she never travelled there. It is attributed to a report she wrote for the British Raj, reforming the public health system of India, over the course of forty years of her life. You will still see pictures of Florence Nightingale in hospitals in Nepal, usually in the Matron’s Office. Here’s the one from Crimson Hospital, in Manigram, Rupandehi district. Nepal is in mourning, and will be for one year according to Hindu custom. Today’s was International Nurse’s Day, and I was honored to share it with nurses and others at Crimson Hospital. 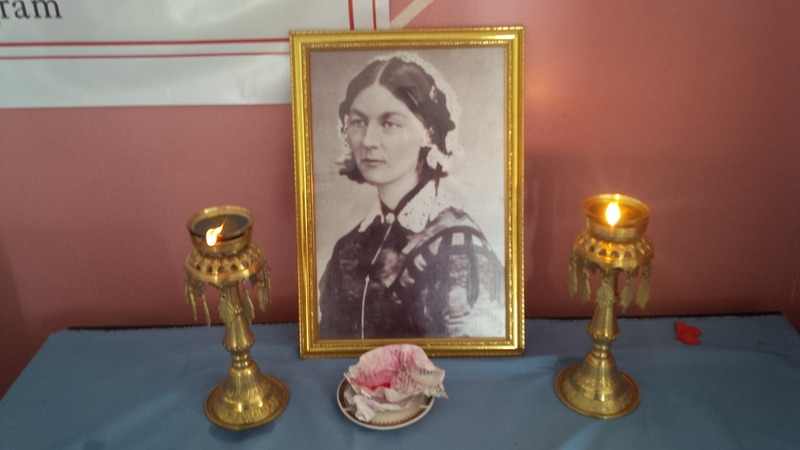 The ceremony was simple – sort of a “Florence Nightingale puja” – candles lit. Main thing was a minute of silence to honor those who were killed April 25th. 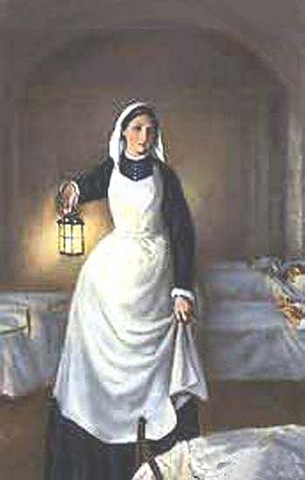 Every nurse in Kathmandu was walking in the footsteps of Florence Nightingale right after the quake. Since the earthquake, there is a lot more interest in the health system of Nepal – nurses and doctors from western countries are interested to volunteer for earthquake recovery. Here is the best advice about volunteering. In this early period, some specialized skills are needed, but don’t come without a sponsoring organization. Be advised, there are ample nurses and doctors within the country to meet their own needs for personnel. If you have never done international nursing, Nepal is not an easy “first Asian country.” feel free to send email to joeniemczura@gmail.com to get advice on how to prepare for serving in this country. Hundreds of nurses from Kathmandu took training from CCNEPal in critical care skills, since 2011. Here are some from Global Hospital. My own project focuses on teaching critical care skills to nurses and doctors there. Lots of pictures on the FaceBook page. Click “like” and follow me for the 2017 trip. Nurses in Nepal performed heroically during the recent earthquake, especially in Kathmandu. Normally nurses never get media coverage, but this has changed. Let’s hope that a new level of media coverage of nursing issues will emerge from this tragedy. Young women can go to nursing school at the age of sixteen, enrolling in a PCL program (Proficiency Certificate Level) for three years. Nowadays more young women are opting for a BSc degree. seen on a classroom whiteboard of a PCL nursing school in Kathmandu, Nepal. Students there are regimented; they learn to love it, and even if they don’t it molds them a certain way…..
An in-depth description of Nepal Nursing Education can be found here. There is one doctoral program for nursing, located at Institute of Medicine in Maharajganj, a neighborhood of Kathmandu. There are M Sc programs, but until recently most nursing leaders studied abroad for their graduate degree. There is a “Nepal Nursing Council” and they are members of the International Council of Nurses. The Council has valiantly upheld standards for nursing education despite a politically unstable government. Most often, nursing students live in a hostel at the hospital that sponsors the school. These hostels enforce strict rules such as no cell phones, no appearing in public unless in uniform, and the like. The students often live five-to-a-room with the same girls for three years, and develop lifetime bonds. There is nothing like sharing a bar Cadbury’s chocolate between friends. (photo by Brad Wong) morning rounds in a Nepal hospital. The school uniform is sometimes a Kurtha Suruwal (“Punjabi”) but often a colorful saree. Nursing students still wear a cap at many schools. Every PCL nurse is also a midwife. The curriculum involves delivering a dozen babies under the supervision of an older nurse. The nursing students live in a society with strict gender rules. Though they have delivered babies, it is often the case that they themselves have not been on a “date” or had a boyfriend in the traditional sense that an American would define. The PCL nursing curriculum is centralized and standardized by a government agency. In the past five years, more young women are enrolling in “B. Sc.” nursing programs. B. Sc. students with their Faculty member. Bhairawaha Nepal May 2014. Males are not allowed to enroll in nursing school. They go to Health Assistant program instead. Traditionally, nursing as a career choice was frowned upon by upper caste Nepalis, because it involved contact with body fluids of other castes. This has begun to change since nurses have gone abroad, earned money outside the home, and sent remittance back to Nepal. Also, investing in the young woman’s education will bring a better choice when the time comes for arranged marriage, which is still widely practiced in Nepal. There is an active “brain drain” of experienced nurses from Nepal to western countries such as U.K., Australia and India. For a discussion of factors related to this, click here. Many Nepali women are going abroad for nursing education in USA or India but they face obstacles when they return. A person with a “foreign” (American) RN license is required to take the Nepali version of NCLEX to get a Nepali RN license, even if they are a Nepali citizen. In Kathmandu, forty per cent of passed-out nurses are unemployed or working as unpaid “volunteers.” B Sc prepared nurses are viewed as lacking in skills and too outspoken. There is a Nepalese American Nurses Association named NANA, based in Queens New York. The model of care most widely practiced in Nepal is “Functional nursing,” in which assignments are divided by task. 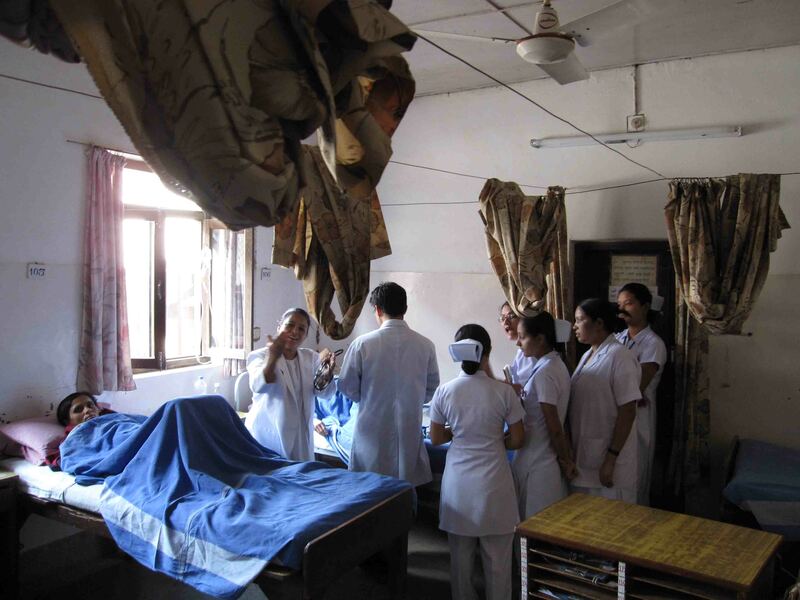 Specialty nursing, (such as ICU nursing) is in it’s infancy in Nepal. Such things as ecg analysis or principles of Advanced Cardiac Life Support are not widely taught to nurses. Many nurses work for international Non-Governmental Organizations (NGOs) on public health projects. This entry was posted in medical volunteer in Nepal and tagged #globalsurgery, #NTI2015, #NurseJackie, #Nursesweek, #nursesweek2015, daily life of Nepal nursing student, Florence Nightingale, functional nursing in Nepal, I want to volunteer as a doctor in nepal, I want to volunteer as a nurse in Nepal, Nepal health system, Nepal nursing, nurses needed for disaster relief in Nepal after the earthquake, Nursing education in Nepal, nursing school in Nepal, teach nursing in Nepal, what is nursing school in Nepal like?. Bookmark the permalink. I came across your blog thru your comment from the Record. My wife’s family in Nepal is running relief efforts as a mother’s group. They have documented their recent trip to Suryakot, Sindupalchok in their blog : https://quakereliefupdates.wordpress.com/ They have been doing more fund raising amongst family and friends, both in Nepal and abroad. Right now they are waiting to hear back from people travelling in the affected districts, so they can figure which areas need the most assistance at that given time. Im writing to you in hopes that you might be able to direct medical resources to them on their next relief effort. It could be medical supplies, or even facilitate networking with available medical staff. Thanks for the good work in Nepal. Thanks. I’m teaching in Bhairawaha these past weeks, and I was originally not going to be returning to Kathmandu until May 27th, after which I leave for USA May 30th. So, I’m not sure what kind of assistance I can lend. Very interesting your article posted in honor of International Nursing Day! I enjoyed it very much, and appreciate as a different experience. I think, with your permit, I must prepare it in PP (in Albanian of course) and present it in the Conference Of Albanian Nursing Order, “Celebrating International Nursing Day”, on 12 of May in Trane. Congrats and have a Happy Nursing Day! please do so. I would be honored. when you do, please email me a copy. I would be delighted.